Okay, so this has nothing to do with blues as a music genre, but I did use the color blue in the mani and it’s for Nail Crazies Unite’s music-themed challenge. I’m also celebrating getting my greed talons into all of the polishes in Sinful Color’s Stoned Crystal Shimmer Collection. They are boootiful with a great formula and they tend to go really well together. 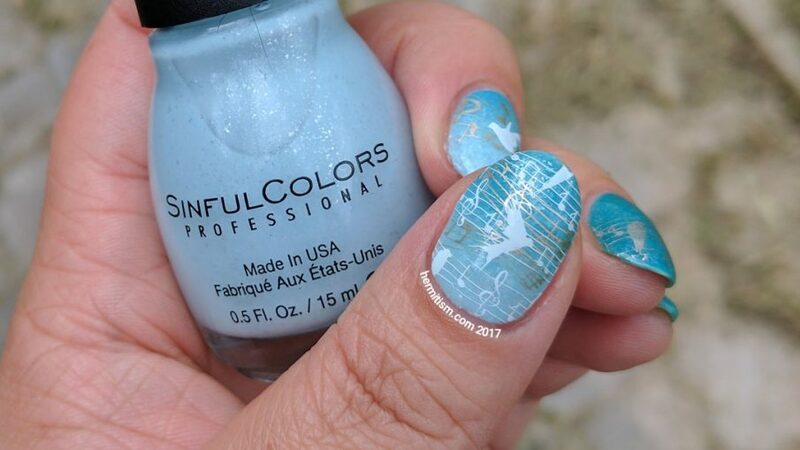 This mani is a good example since I used two of them to create the base for my nail art. 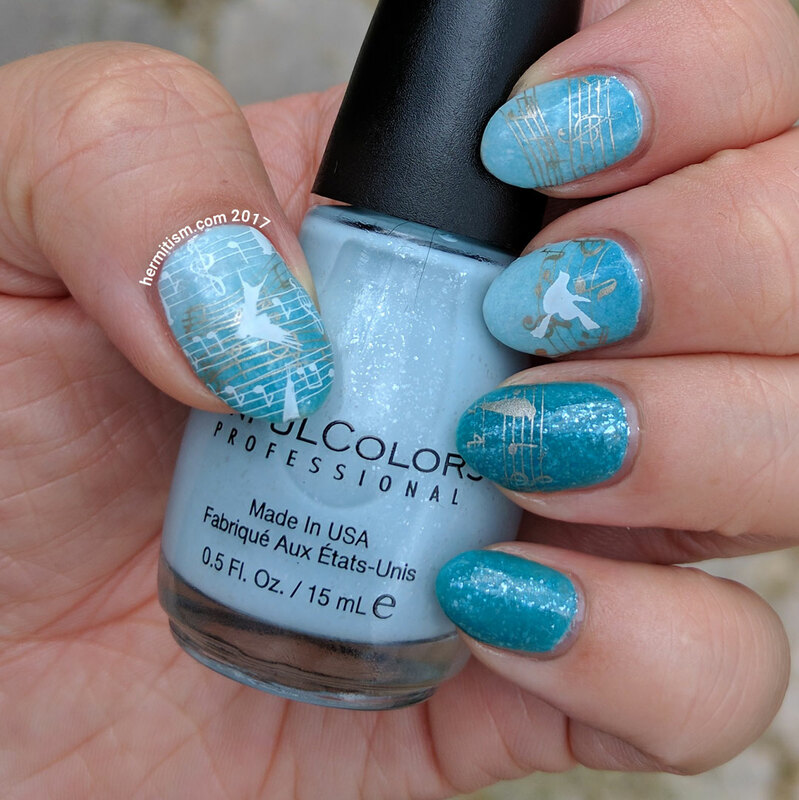 I chose to focus my nail art on birds since Born Pretty had a great full nail stamp with birds sitting on sheet music lines. Sinful Colors is such a good brand. When I first started seriously collecting nail polish Sinful Colors was great low-hanging fruit. I was poor and Walgreens ran so many sales where you could get them for $1 a bottle. They also weren’t playing around with releasing a slightly higher end line. Fewer and less generous sales and too many close to duplicate colors + an already large collection of polishes means I’ve slowed down in my purchasing. Still. Back before I even collected nail polish (over ten years ago), Sinful Colors had my back. I owned two bottles. One was a rich beautiful purple and the other was a glorious orange glitter that I eventually had to throw out because it dried out. I’ve never found a replacement to match it. 🙁 I heartily recommend Sinful Colors as a good place to start collecting. Read reviews before you buy since they don’t always have great formulas, but there are definitely bottles I reach for over higher price point polishes. Remember: higher price does not always mean better polish. Yay, you found this line! I’m a happy for you because I remember you were looking for it and it’s so much fun! I love the soft look you did with it. Very lovely!